We like to think that things happen for a reason, that the good — and bad — things that happen to us aren’t just random. We like meaning and some sense of control in our lives. However, as Leonard Mlodinow points out in his book The Drunkard’s Walk, the reality is that randomness plays a much bigger role in our lives than we are often willing to admit, or are even aware of. The Drunkard’s Walk is a tour of the history of our understanding of random processes, with the goal of showing how randomness infiltrates our lives. 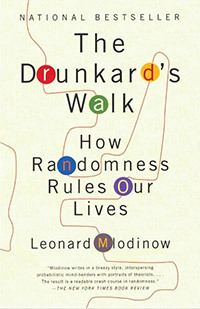 From clear demonstrations of this randomness, such as the lottery, to less obvious ones, such as the success of a movie or song, Mlodinow shows us how things all around us are quite often the consequence of randomness. I took from this book two main conclusions. First, humans have such an overarching need to feel in control, to see order in the universe, that they often see paterns in what is really random data. Mlodinow points out that one of the biggest causes of stress in humans is a feeling of not having any control. Indeed, research has shown that people who don’t have control of even simple things — like watering a plant — give up more easily and, consequently, die at a faster rate than those that have the purpose of watering a plant. Stress is certainly one of the biggest factors in health and feeling out of control, in the sense that you have no control of your life or destiny, is a big contributor to stress. This clearly suggests to me that micromanaging is overall a bad way to run an organization, as it does not let the lower rungs of the ladder have any control of the processes they are involved with and, as a consequence, will be more stressed and less healthy. The second point is that success is often as much influenced by randomness than not. In fact, Mlodinow implies (if not outright argues) that random factors are often more important that pure skill or talent. Many talented people succeed simply because they were at the right place at the right time, through no conscious planning or act on their part. Conversely, many talented people fail because they didn’t get the big break. This is true at all levels of society, from the homeless guy who had a string of bad luck, to the CEO who essentially got lucky overseeing a company when it hit big. Mlodinow uses a number of examples that show how the success of baseball teams has, in the end, little to do with the manager and are really just a consequence of randomness associated with whether a batter gets or doesn’t get a hit. He also highlights how past performance of CEOs or movie moguls has little bearing on future performance and it is essentially a random process. And how what song becomes the most popular is a lot of random luck and not necessarily a measure of how “good” the song is. In the end, persistence is a much better indicator of success than talent, indicating that we shouldn’t reward successes and punish failures, but we should reward effort, regardless of the outcome. An important point he makes is that we are so hardwired to attribute success to our abilities that we automatically become condescending to people who fail. Mlodinow describes experiments in which subjects watch people being punished, either for their supposed failures at some task or because of their supposed suffering for some more noble goal. The consequence is the same: simulated electric shocks, but the explained reasons are different. In the cases in which the punishment and resulting suffering are viewed as a consequence of the person’s failures, subjects very quickly form a negative opinion of the person, attributing some shortcoming of the person. This has consequences for social policy. If who ends up as a CEO or movie star versus homeless on the street is a much a consequence of random factors as any intrinsic talent or skill, then it could be any one of us that ends up in one or the other. It isn’t a result of our abilities, it is a result of random factors none of us can control. Thus, there is little that separates the highest from the lowest and we should do more to help those who, due to an unfair amount of bad luck, fall through the cracks. I have discussed the role of randomness on success in the past. It seems that moer and more evidence points to the fact that randomness plays a bigger role in our lives that we readily admit. In a society that automatically assumes that success is the direct consequence of ability, should we perhaps reevaluate some of the resulting social apperati that has been built around that assumption? I’m not saying we don’t reward those who do well, but maybe we also reward those who try hard, even if they don’t always succeed?